Toasted pearl couscous with pistachios and pine nuts, chewy raisins, a hint of cinnamon, and a squeeze of lemon combine in this incredibly flavorful Israeli Couscous dish. Perfect as a side dish or an easy lunch all on its own, this is one couscous recipe you need to try straight away. Over a year ago, my sister, Jenny, told me that she had a dish she wanted to make for me and described this Israeli Couscous. I’ve looked forward to trying it ever since the first time she mentioned it. This past month, we finally had the chance to make this recipe together. Served with Pan Fried Chicken Thighs, this is a meal that is as perfect as it can possibly be. 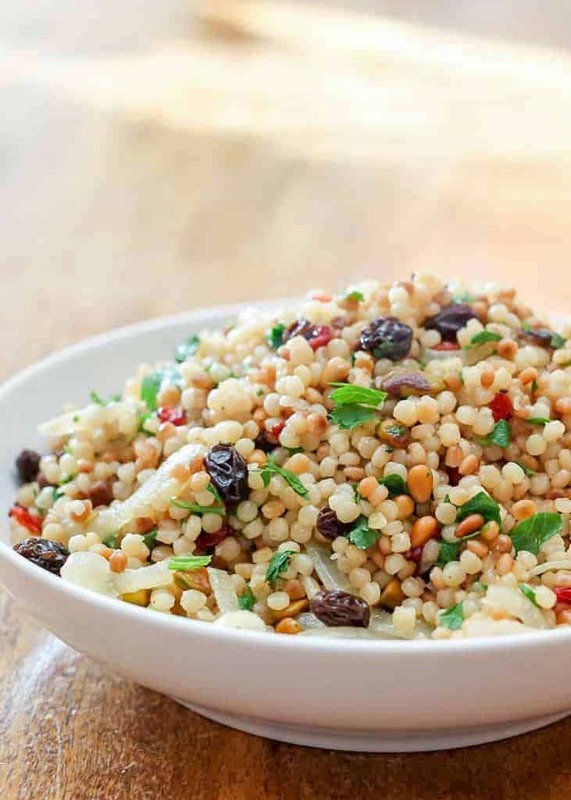 Savory pine nuts and pistachios coupled with sweet raisins and flavorful mediterranean herbs and spices make Israeli Couscous recipe stand out. It’s so much better than just about any other couscous recipe I’ve tried. I loved this couscous so much, I hid the leftovers in the back of the fridge and helped myself to them frequently over the next couple days. This is a wonderfully easy side dish that is substantial enough to stand alone for a meal. Israeli Couscous keeps fabulously in the refrigerator and I can see myself making future batches to eat for my lunches all week long. Couscous looks and cooks very similar to grains like rice and barley but it’s actually pasta! If you’ve only ever had traditional couscous, the itty bitty pieces that have a powdery texture, you might be surprised by Pearl Couscous. This type of couscous (also called Israeli Couscous) are little round balls of pasta. 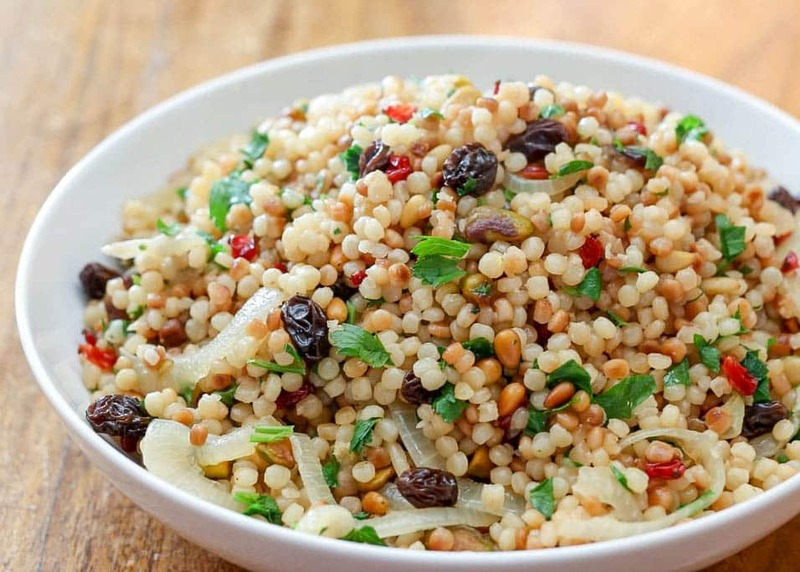 Pearl Couscous are slightly chewy, a little bit nutty, have a satisfying bite and taste absolutely nothing like traditional couscous. Couscous is popular in mediterranean cooking but it’s also a way to shake things up if you’re tired of the usual rice and pasta side dishes. It goes so well in salads and stir-fries and is super easy to cook. I am head over heels in love with this dish and I can’t encourage you enough to try it for yourself. Couscous gets much of its flavor by toasting it in oil or butter in a pan prior to cooking it water or broth. In this recipe, the dried couscous is added to a pan with melted butter along with chopped onions and a cinnamon stick that adds such a nice level of flavor. Once brown and toasty, I add chicken broth to the couscous and simmer it all until the couscous is perfectly tender. 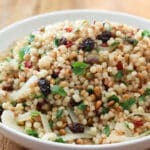 Your couscous will be ready to enjoy in less than 10 minutes making it the ideal side dish for busy nights. Couscous stores well in an airtight container in the fridge and freezes well too. 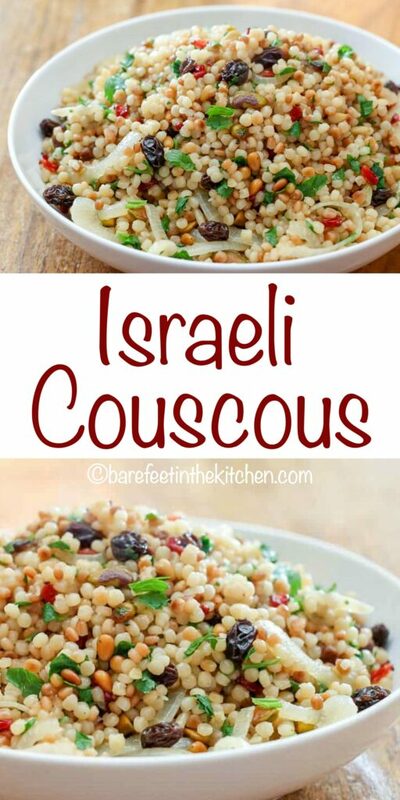 Once you make this Israeli Couscous recipe you might find yourself wanting to make Pearl Couscous over and over again, eating it just as it is or enjoying it in Summer Israeli Couscous Salad (one of my favorite lunches). Check out this Easy Tomato Cucumber Couscous from She Wears Many Hats for another super simple and quick way to enjoy couscous. Warm the oil in a large deep skillet over medium high heat. Add the pine nuts and pistachios to the skillet. Saute until toasted and fragrant. Remove from the skillet to a plate or small dish. Melt the butter in the skillet and then add the onion, couscous, and cinnamon stick. Cook, while stirring frequently, until browned. Add the chicken broth, bring to a boil, then reduce to a simmer. Simmer until the couscous is tender, about 6 minutes. Remove from the heat. Add the barberries, raisins, toasted nuts, parsley, and lemon zest. Stir to combine. Taste and salt as needed. Enjoy! Oh hellllllooooooo Israeli Couscous salad. I've been WAITING for this one to pop up in my feed! YAY! This would make a lovely addition to the Australia Day BBQ - pinned!